Please join us for this month’s club dive at County Line on Sunday, March 24th, 2019. 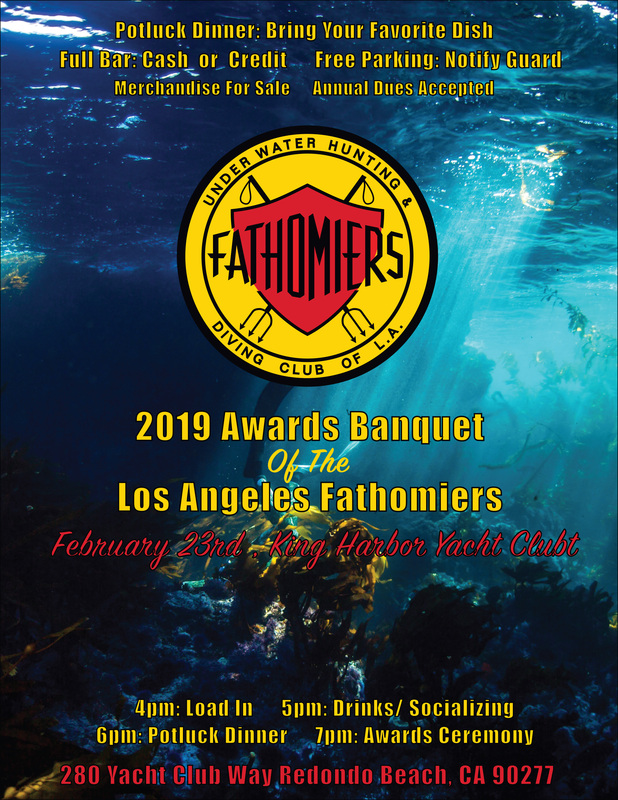 The 2019 Awards Banquet of the Los Angeles Fathomiers is this Saturday, February 23rd. See the Event Page for details, of the flyer below. A reminder that there is no February Club meeting. Instead, our annual Awards Banquet will be held later in the month, exclusively for Members, Tentatives, and their invited guests. Please join us for this month’s club dive at Hawthorne Trail on Sunday, February 17th, 2019. Please join us for this month’s club dive at Malibu Colony on Sunday, January 20th, 2019. Please join us for the annual Larry Staat Pole Spear Competition at White’s Point on Sunday, December 9th, 2018.